transition | You Can Shake the Gates! transition – You Can Shake the Gates! I have a friend named Sominak who lives near Uria Village. He is gentle, intelligent, thoughtful. He has a charming way with people and immediately puts children at ease. He is a school teacher, a leader of teachers. When Angela and I first moved to Uria Village in the late 1990’s, Sominak was working with several other teachers to develop reading primers for Somau Garia speaking children. The idea was to develop a whole library of simple story books, introducing letters, vowel sounds, and simple words along the way–richly illustrated so that young minds could connect the images with the words on the page. Sominak is gifted at taking the 16 letters of the Somau Garia alphabet and making them interesting. He is an artist who did most of the artwork for the primers, so he can draw a lot of fun cartoons on the board. Imagine having a teacher draw an amazing picture on the blackboard and letting you come forward and write the name below the picture. He knows how to draw the best out of people. 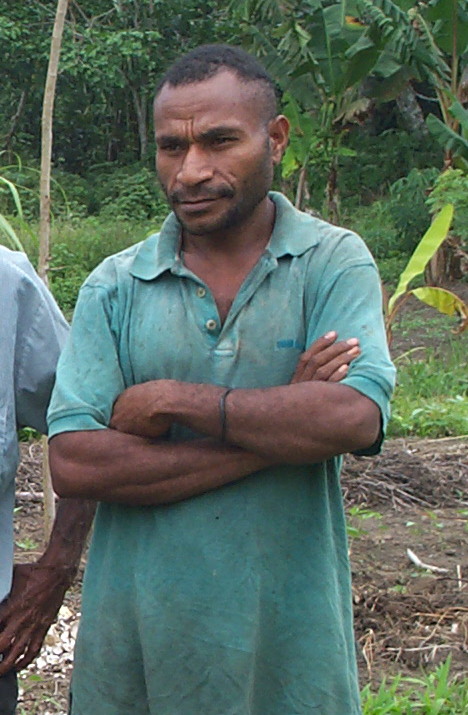 While Sominak’s primary role over the years has been literacy, he has given much of himself to the translation of the New Testament into the Somau Garia language. The Gospel According to Mark has been in use since 2007. The remaining 26 books await translation. Men like Sominak await their translation. The Word of God in the language of the heart has the power to transform a people. Angela and I long to be in Papua New Guinea again soon, working alongside friends like Sominak, getting the Word out to a people needing the power of the gospel at work in their lives. Now through the end of 2013 we are asking God to raise up 40 new monthly financial partners, 40 new special gifts partners, and 40 new intercessory prayer partners to see the Word of God be available in the mother tongue of the Somau Garia people. If you’d like to partner financially with us in this venture of faith, you can click here to visit our Donate page where you’ll find instructions on how to do so. If you’d like to join the cadre of prayer partners, click here to drop us an email informing us of your commitment. Thank you for reading this post. Thank you for praying. Thank you for giving of yourself to get the Word out to a precious people whom God loves very deeply. Just sitting in a restaurant that has Wi-Fi, jotting some final thoughts before heading back to the place we are staying. Just a few days before jumping across the big pond. Pray for Todd as he prepares his mind and heart throughout the weekend for the journey. Pray for the Holy Spirit to encircle and fill Todd’s mind and heart with peace, truth, and focus to hear what the Spirit is speaking–also for clarity. Pray for Angela and the girls as they are away from home for the next month. Pray for God’s peace to be theirs, for his Spirit to quiet and move in them, for them to reflect Christ’s glory in each situation that they encounter. Pray for the boys as they study, work, relax, make new friends, and listen for the still, small Voice. Your prayers are making a significant difference. Keep them going up! August 15 (Day 5) — Thursday. Samuel is moving in Boatman Hall today, the same floor that Todd lived on as a student at Ozark. Pray for him. His emotions will be excitement mixed with the uncertain wonder of life without family close at hand. Pray that God will use this school and these people to pull back the veil a little further and allow Samuel a more intimate and empowered relationship with Jesus.